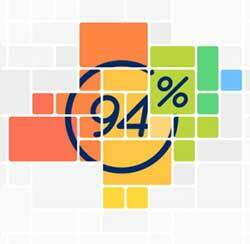 Walkthrough of 94% Children Love It Answers for every question in 94 percent game cheats. If I say Countries involved in WWII and show you a picture of stressed man at work, what comes to mind first? think some words that words associated with questions that will cover 94 percent of the given answers ! Thankyou so much for that comment! Also on IOS/iPhone it’s computer, not frustration!